Today I’m going to answer a couple of questions to do with stats and growing your audience. Q. What is the best way to track how many people have downloaded my podcasts? A. 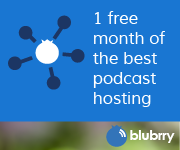 Get free stats at Blubrry.com 🙂 or, if you are hosting at libsyn, upgrade to their stats package if your plan doesn’t inculde stats. 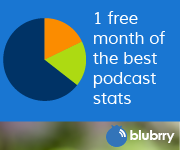 Even if you are at libsyn, you can add free blubrry.com stats (or premium stats if you want). I believe podtrac also does free and paid stats. Not sure on that one..
Q. My google analytics (or other webstats) say that my mp3 was accessed 30,000 times, but my media stats only say I had 302 downloads? What Gives?? A. Web stats are not designed to measure media files. The way media files are served (called byte range requests) cause the file to be requested multiple times per play or download which register as a “download” or a “hit” to webstats. Media Stats such as blubrry and libsyn take that into account and know that even though a file gets 30 requests from the same IP address while downloading or streaming the file, it only counts that as one. It is a much more accurate measure of the number of downloads. If you are going to have advertisers, it’s much better to tell them the truth about how many downloads you have rather than inflating the numbers. If you tell and advertiser that you get 12,000 downloads when you only really get 1000, they will think that even with 12,000 downloads, we are only getting the results for like 1000. It make everyone in this space look bad. Q. Feedburner says I have 200 subscribers, What does that mean? A. You should, by now, know my feelings about using feedburner or any other 3rd party feed services. BUT, I will try to explain this one anyway. The “subscriber total” that feedburner reports is of little or no value. What Feedburner reports to measure is “subscribers”. What I would think that to mean is how many people, using feedreaders or iTunes, are subscribed to your podcast RSS feed. What it really measures is how many different ip addresses “hit” your rss feed in a 24 hour period. It can vary wildly from day to day. It might give you a very rough idea, but it’s just that a rough idea. Also, if you are using feedburner, you have a base feed that is feeding feedburner. Some, if not a significant number, of people could be getting your podcast directly from your base feed. (likely the feed from your website) It’s even worse if you use a captive host such as Blog Talk Radio, podOmatic or TalkShoe because these sites also submit your “podcast” feed (from their site) to itunes and other directories. SO, your feedburner stats will be less accurate and not catch everyone. To switch gears a bit. I get this question a lot…. Q. How do I grow my audience? A. This is a BIGGIE… There are a 1000 ways to promote your podcast and even more ways to NOT grow an audience. Let me start with The top 10 that will help you gain listeners. Be yourself. don’t try to be the big-shot radio guy (or gal) and make it seem as though you are Broadcasting to the little people out there. That is unless you are a broadcaster 🙂 The great thing about a lot of podcasts are their authenticity. If you seem fake, people will pick up on that and will not be long-term listeners. Be patient, it takes time. Communicate with your listeners. Try to learn the names and a little bit about as many listeners as you can. Always answer your email, twitter, facebook and other forms of communication.